Goshh.. I feel so grateful to be given this chance! Alhamdulillah..
Well, 3 days before my dad sent me the message, I dreamt about Kaabah. 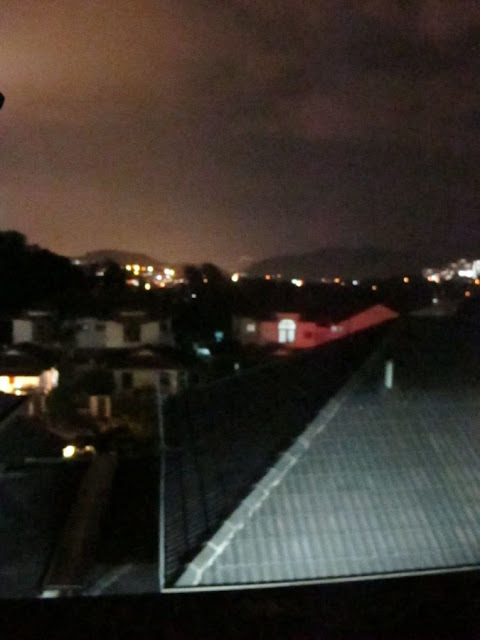 And in my dream, I woke up around noon or something (in my current room) ..and then I felt weird because I heard like some noises outside my window.. (just so you know, the window that I'm talking about, is facing some other houses, tapi rumah rumah tu semua dekat bawah sikit.. Just nampak their roofs je la. So basically kalau betul betul - in real life I mean, memang tak akan dengar apa apa bunyi lah except for burung burung berkicauan or whatever..) So, I thought it was weird..so I walked to the window to open and see if there's anything.. Seriously, the dream felt so real because all the things that are in my room like my curtains, the cabinet and my stuff were all in my dream! So this is the view from the window that I'm talking about..
And then later, 3 days after that dream, I received a text message from daddy saying, "We'll be going to Jeddah on 31st until 7th (the date has been changed to 6th till 17th, btw). So go and get your picture taken asap. And fill in the form for the visa. Tomorrow Asmadi will collect all the things needed for the visa from you. Thanks". Seriously, saya terkejut sangat sangat! Well.. To be honest with you, for years and years, I have been praying to God to give me another chance to visit the holy land again and again and again, and to perform as much ibadah/umrah as I could. The last time I went there was like 6 or 7 years ago.. And I really really missed Mecca so much. I missed the feelings when I was there. It was so peaceful. So everyday, I would be praying to Him to give me another chance to go there again..And Alhamdullillah, Allah granted my wish! Sungguh tak sangka dapat panggilan to Mekah, again! Alhamdullilah! Rasa macam nak nangis jer.. heee. I remembered the last time I went there, the moment I saw the black giant squared box in the center of the floor, I was mesmerized by the view and my eyes was magnetized to the Kaabah.. Seriously, what a magnificent view! It's really really different from seeing it on the telly or Youtube or pictures or whatever! Every time I went inside the Masjidil Haram and saw the Baitullah, it really felt like it's my first time seeing it! Yes, every single time masuk masjidil haram! Such an amazing feeling! I mean, how can a black giant squared box, would look so amazing and breathtakingly beautiful??!! Macam asik nak tengokkkkkkkk jer tak nak kelip mata. Ha, macam tu la the feeling! That's how beautiful it is! Anyway, Insyallah, I will be going to the holy land tonight. Will be there for about 10 days. Pray for my health and well being. And I really hope that everything will go on smoothly and easy for me. Do pray for me, guys! i miss being there too..hopefully dimurahkan rezki untuk ke sana lagi..
Mudah2an di mudahkan segala urusan...wani doa supaya dpt jodoh yg baik juga,ni la peluang sbb doa kat sana lebih makbul.Amin. When u in masjid nabawi,mohon sampaikan salam saya kepada rasulullah n sahabat2 baginda. i don't know why but i feel like crying when i read this entry. knowing that other people had got the chance to perform umrah again and again while i haven't got any chance to experience it. it must be a great experienced right? :) u're so lucky wani. i wish that Allah will give me the chance too (always pray for this after my prayer). take care when u're there. happy ramadhan! smoga dilindungi , disihatkan tubuh badan dan smoga pergi dan pulang dengan selamat..
Semoga dapat Umrah, and Ramadhan yang Mabrur. InsyaAllah.. I miss Mecca too! ok now I feel like crying..
Doakan aku dapat bersalin dengan selamat dan mudah yer adik.. 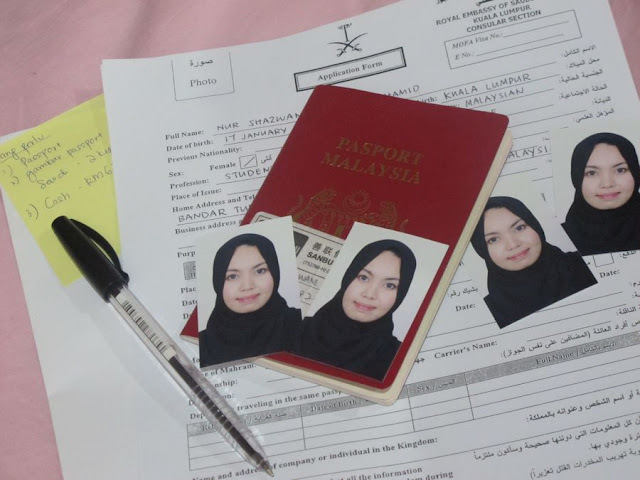 In the passport pic, u really look like Hanis..
Saya pun nak mohon sampaikan salam saya kepada Rasulullah s.a.w n sahabat2 baginda kalau melawat makam baginda and Baqi'. 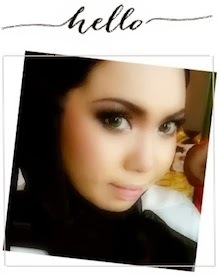 salam.. i'm ur silent reader..